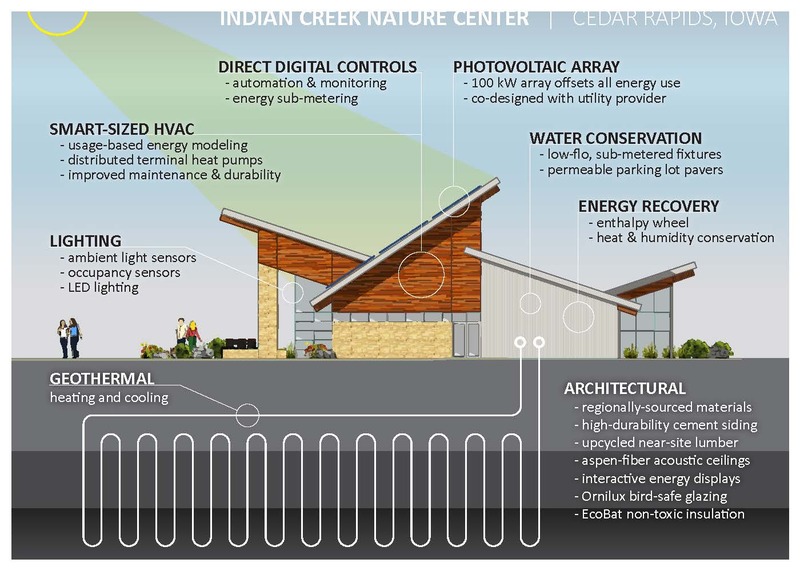 CEDAR RAPIDS, IA — Amazing Space, Indian Creek Nature Center’s headquarters located in Southeast Cedar Rapids, was selected from a field of international nominees to receive the prestigious Technology Award from the American Society of Heating, Refrigerating and Air-Conditioning Engineers (ASHRAE). 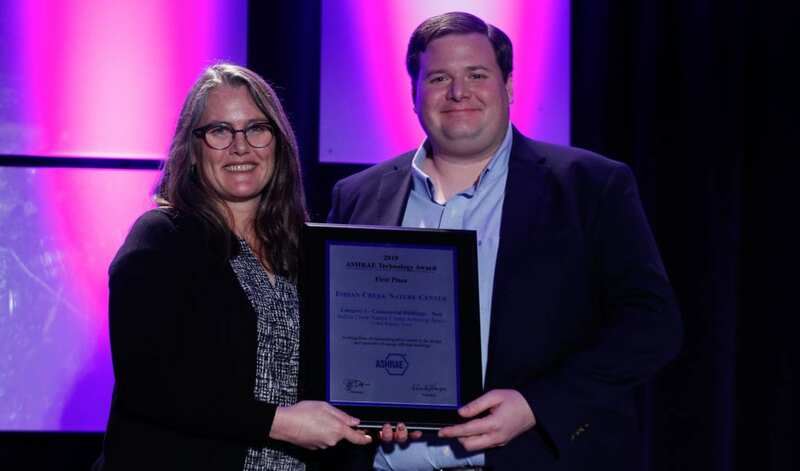 The award was given for Amazing Space’s integrated approach pairing low-energy building systems along with high performing renewable generation systems. 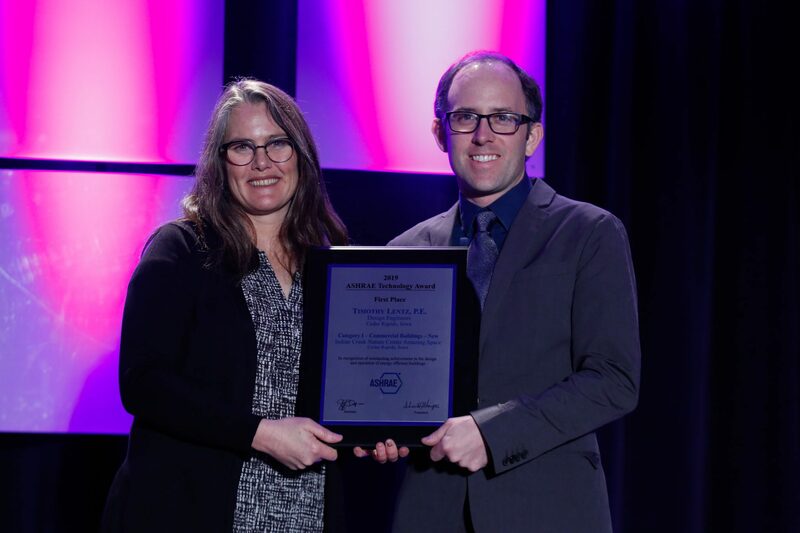 The ASHRAE Technology Awards recognize outstanding achievements for projects which have successfully applied innovative building design in the areas of occupant comfort, indoor air quality and energy conservation. Their designs incorporate ASHRAE standards for effective energy management and indoor air quality. Performance is proven through one year’s actual, verifiable operating data. The award was presented at the ASHRAE winter conference in Atlanta, Georgia in January. Indian Creek Nature Center Executive Director John Myers and Design Engineers Project Manager Tim Lentz accepted the award on behalf of the entire staff, board, and project team. Located in Cedar Rapids, Indian Creek Nature Center is Iowa’s first and only privately owned and operated non-profit nature center. With 500 acres of land under its management, the Nature Center hosts thousands of visitors each year for nature-based programs and activities. The mission of the Indian Creek Nature Center is to promote a sustainable future by nurturing individuals through environmental education, providing leadership in land protection and restoration, and encouraging responsible interaction with nature. ASHRAE, founded in 1894, is a global society advancing human well-being through sustainable technology for the built environment. The Society and its members focus on building systems, energy efficiency, indoor air quality and sustainability within the industry. Through research, standards writing, publishing and continuing education, ASHRAE shapes tomorrow’s build environment today. Established in Cedar Rapids in 1983, Design Engineers partners with building owners, architects, and construction teams to craft Mechanical, Electrical, Plumbing, Fire Safety and Technology systems for their most important and challenging projects. DE designs intelligent systems so buildings can run efficiently and effectively. GIVEAWAY: Enter for a chance to win tickets to Maple Syrup Festival & more! Sustainability Tip: Catch April showers in a rain barrel! Sustainability Tips: Make your own maple syrup!